I'm heading on vacation for a week so I thought I'd slap something on the board for now. Thanks so much for listening to this wonderful song by Burton Lane and Ralph Freed. hey insomnia has it's benefits! Simply wonderful song and performance! Thanks for sharing your huge talent here. Love them keys, great sound and another fine vocal, wonderful song and a great performance. I got to the front door and was turned away as the riff-raff I am because I didn't have the two cents. So I went around to the back alley. The kitchen help let me hang out there and listen. Great song. Those guys on organ and guitar rock. That singing guy's pretty damn good too. Very nice track. A little bit more on the pop side than what you usually do. 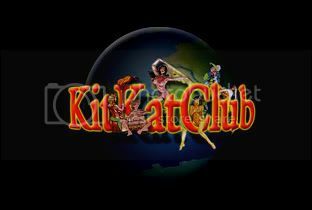 There is NOTHING like an evening at Club Kit Kat when you're headlining... You're one WILDLY entertaining and Super Talented performer!!! Loved this, Moe!! Wicked tune man, not heard this before so nice to be brought it! The instruments are super cool, vocal is just becoming standard awesomeness. Another fantastic installment in the Klein/Pike opus. Loved the organ and your vocals are as irreverent and inventive as ever. Have a great holiday. Take care, Peter. Oh I love NY in June too! What a terrific song, even if that toothless elf disagrees. Your singing is just fantastic, nothing like it on earth. Love it, love YOU too! Nice version of this classic song. About midnight here. Perfect for sending me off to slumberland with a smile. As always a great pleasure and much appreciated! Backer. Cool organs and panned drum splashes are a treat from Mr McPike. Hmmmm I think this is heading to top of my MJK chart. Your voice is mixed with an extra splash of honey on this one. I like potato chips too (crisps as the queen says) I eat my own bodyweight in prawn cocktail pringles daily.... Yum!! One of your best vocals and the organ is really jamming. As usual, a fantastic performance. Really dig the guitar lead. The keys accompany well through out and of course the singing is spot on. I love when you sing so much. I was so tired now with working so much. But now when I listen to you sing I am dancing. Have so much fun on the vacation. The entertainment value is always off the charts with you MJK. Not only that but your songs are educational as well. I often find myself googling the artists and such as you mention them. Oh yeah - I like it. wonderful, swingin'. Justin Bieber ha ha. Thanks for the great II V guitar lick- I'll be using that on my next recording!